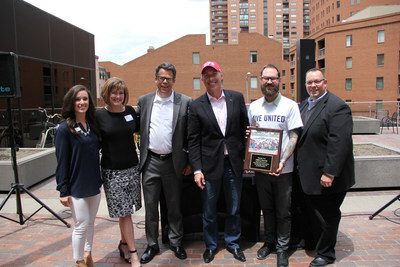 SAN DIEGO, May 24, 2017 /PRNewswire/ -- Bridgepoint Education's Ashford University Denver employees were honored by the Denver Public Schools (DPS) Foundation and Mile High United Way on May 16 at Bridgepoint's downtown Denver location. The longest corporate partner participating in the Power Lunch reading program, Ashford employees have been volunteering in the program for five years. Weekly volunteer activities involved employees tutoring third graders in literacy at Smith, Harrington, and Valverde elementary schools. Bridgepoint president and CEO Andrew Clark accepted the award on behalf of Bridgepoint and Ashford. "It takes all of us to ensure we reach our vision, Every Child Succeeds, and we are incredibly grateful for Ashford's five-year commitment to DPS students through the Power Lunch program," said Verónica Figoli, DPS Foundation president and CEO. "Every hour an Ashford employee spends reading with a student is an investment in that student's long term success in school. And when our students thrive, our communities thrive." "Mile High United Way believes all children should have the opportunity to succeed, and we couldn't be more thankful to Ashford for sharing that same vision," said Christine Benero, president and CEO of Mile High United Way. "Over the past five years, they have been an advocate and role model for kids and families in our community through the Power Lunch program; their commitment is inspiring." The celebration included bringing students in the current Power Lunch classroom from Valverde Elementary to the Bridgepoint offices in downtown Denver. Students and tutors were provided lunch while working on a literacy activity together. "It's an honor to partner with Mile High United Way and Denver Public Schools Foundation with the Power Lunch reading program," said Clark. "Youth outreach is core to our giving mission. We believe in the power of education and the importance of supporting youth literacy." In addition to Power Lunch tutoring time, Bridgepoint employees have also provided books to students to have and read over school breaks. To learn more about the Mile High United Way, visit www.unitedwaydenver.org/. To learn more about the Denver Public Schools Foundation, visit http://www.dpsfoundation.org. The Denver Public Schools Foundation is Denver Public Schools' fundraising partner, generating resources, building relationships and championing public education to impact system-wide achievement in order to realize the vision of Every Child Succeeds. The DPS Foundation engages the entire community in support of DPS' more than 92,000 students and nearly 200 schools. Learn more at www.dpsfoundation.org. Working side-by-side with the community, Mile High United Way takes on the biggest issues facing Metro Denver. Our united approach changes the odds for the children, families, and individuals in our community, and moves them out of poverty. We believe every child has the right to a safe and stimulating place to learn, and that when every youth in Metro Denver graduates prepared for college or career, our community is stronger. We also know that when people don't have their most basic needs met, longer-term goals like financial stability, are out of reach. When we work together, we make a lasting, holistic, and sustainable impact on our community. Learn more at http://www.unitedwaydenver.org/ or for sponsorship information visit unitedwaydenver.org/luncheon.